sour cream | Delectably Scrumptious. You are currently browsing the tag archive for the ‘sour cream’ tag. My aunt sent my mother a recipe for Sour Cream Coffee Cake, which was adapted from a recipe she found printed on a package of King Arthur Flour. I decided to make two sour cream coffee cakes- one for my family and one for my friends for New Year’s Eve so I doubled the ingredients. This recipe is for 1 cake (9 inch pan). Serving size is 12. The only thing I did differently was whisk the batter on my own without an electric mixer and use a regular aluminum 9 inch pan rather than a springform pan. It came out great nevertheless. Preheat the oven to 350 degrees. Make the topping: In a small bowl combine 1/2 cup sugar, cinnamon, vanilla, and walnuts; set aside. Make the cake: Butter and flour a 9-inch springform pan; set aside. In a medium bowl, whisk together flour, baking powder, baking soda, and salt; set aside. In the bowl of an electric mixer fitted with the paddle attachment, beat together butter, sugar, and eggs until smooth. Add the flour mixture alternating with the sour cream, beginning and ending with the flour mixture. Spread half of the batter into the prepared baking pan, and sprinkle with half of the topping. Repeat with the remaining batter and topping. Bake until a cake tester inserted in the center comes out clean, 25 to 30 minutes. Cool for 15 minutes, then remove sides of pan and place on a wire rack to cool completely. Serve topping side up. Cinco De Mayo part 2. The first time I went with my friend we had some seafood paella, which was mighty tasty. This time I went with Cindy. 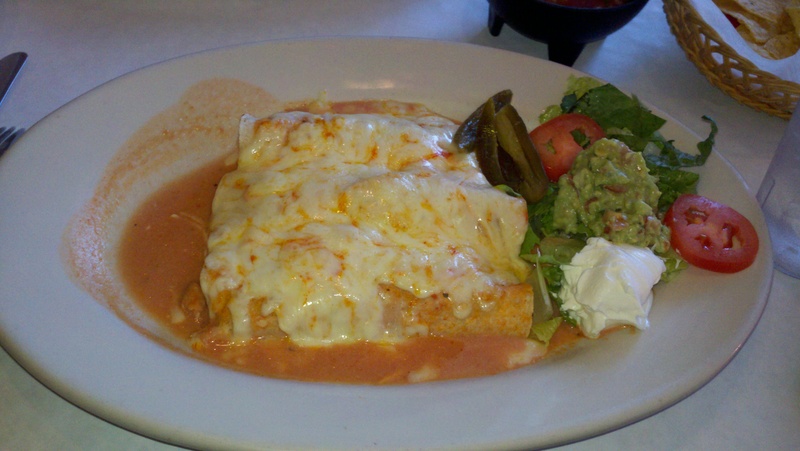 We ordered some standard Mexican food which was the Arroz con Pollo and the Chicken Enchiladas. Arroz con Pollo literally translates into chicken with rice. 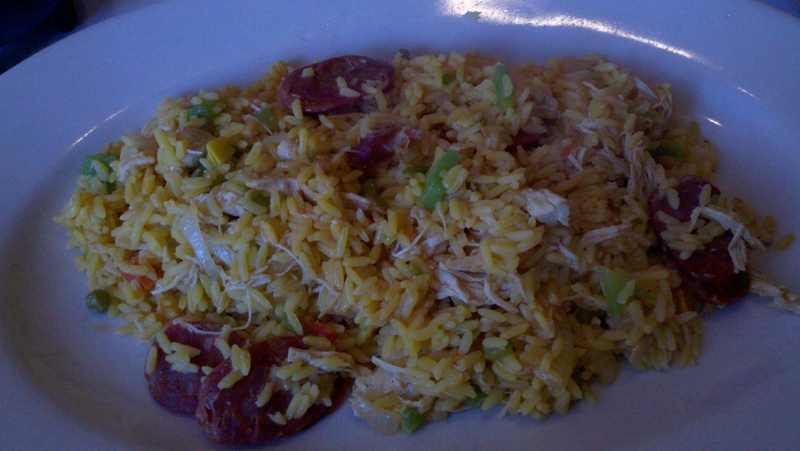 It is basically a Mexican version of chicken fried rice with bits of chorizo. I cannot get enough of this dish which was originally recommended by my friend. Cindy got the chicken enchiladas with a side of refried beans and rice. Both dishes were delicious and highly recommended.